Subrat Mohanty and Purnima Jolly discuss STREAM Community Engagement at this year’s World Conference on Lung Health. Today’s poster presentation, given by Subrat Mohanty, the STREAM trial community engagement coordinator in India, discussed the key community engagement milestones achieved at two STREAM trial sites in India: Chennai and Ahmedabad. The poster drew on the STREAM trial experience to share lessons learned with regards to community engagement. India continues to have the highest TB burden in the world and is included in all three high-burden country lists for TB, TB/HIV, and MDR-TB. STREAM Stage 2 is working in India to evaluate the safety and efficacy of an all-oral nine-month MDR-TB regimen. Prior to the STREAM trial, neither of the two trial sites, the National Institute for Research in Tuberculosis (NIRT) and the B. J. Medical College (BJMC), had included community engagement in their clinical research. With the advent of the STREAM trial, Community Advisory Boards were established and trained in working with the community. Community Engagement is key in clinical trials as it allows for a sense of collaboration between the community and trial implementers, it promotes a sense of trial ownership within the communities, and serves to establish a culture of collaboration between researchers and the community. Between January and June 2018, STREAM trial CABs in India have held 14 planning and coordination meetings, received training on the informed consent process, provided psychosocial support to trial participants, and assisted researchers with community outreach. 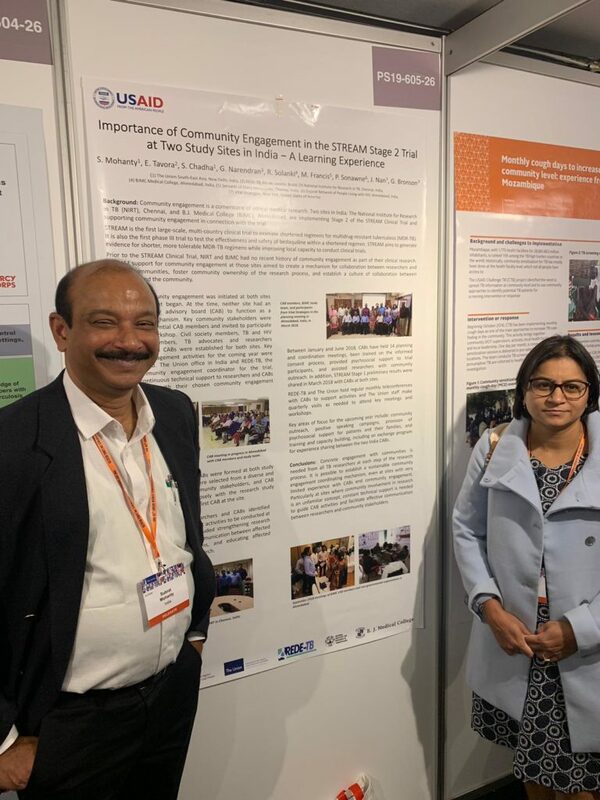 To read more about the community engagement activities carried out as part of the STREAM trial in India, find the poster here.